While installing DVBlogic Server (http://www.dvblogic.com), I ran into an issue where my ehome IR transceiver drivers wouldn't install on WHS 2011. This prevented me from switching channels on my dish network 211k receivers, which were feeding video signals to my capture devices (Hauppauge HDPVR & a colossus card). 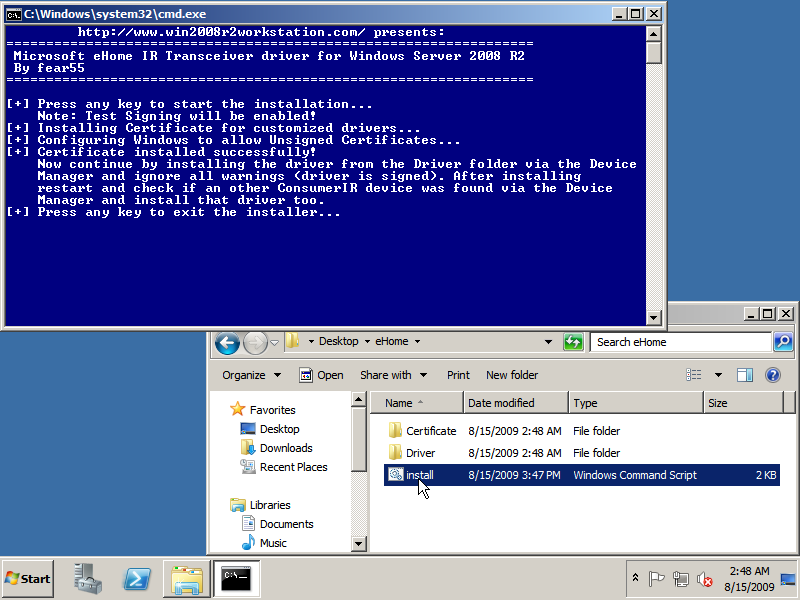 By default you can’t use the Microsoft eHome IR Transceiver in Windows Server 2008 R2, but using this page you ‘ll install drivers to get the hardware working. These drivers were extracted from the Windows 7 x64 RTM MSDN dvd. 1. Download eHome.zip (296 KB) from win2008r2workstation. 2. After downloading the zip extract the zip, run install.cmd as an Administrator and follow the instructions on the screen. 3. Install the drivers via the Device Manager using step 2 – 5 at the Drivers page.